Friends of Sam Smith Park: PARK'S ASH TREES BEING TREATED FOR PROTECTION FROM THE EMERALD ASH BORER. PARK'S ASH TREES BEING TREATED FOR PROTECTION FROM THE EMERALD ASH BORER. There are a number of trees in the park with yellow markings on them. 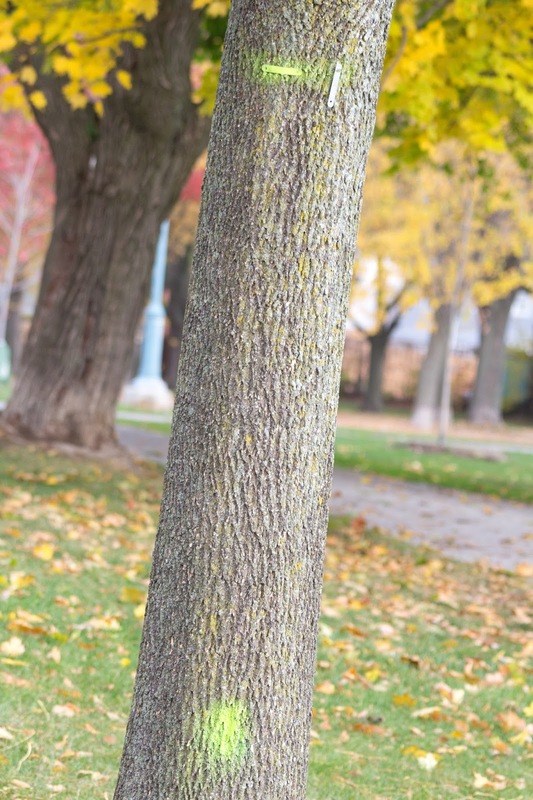 These are Ash trees and they have been treated with TreeAzin to protect them from damage caused by the Emerald Ash Borer. The upper tag has treatment information on it and the lower mark is the injection site. Click here for more information from the City of Toronto's Parks, Forestry and Recreation Department.